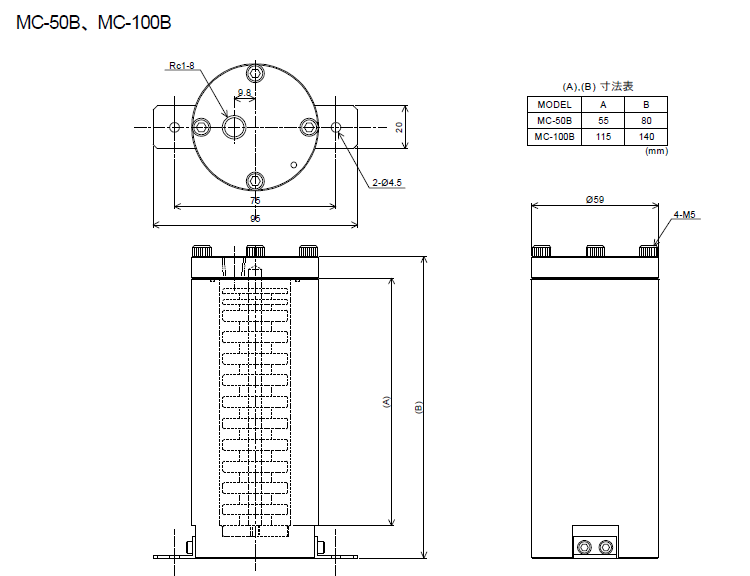 Master Chamber MC Series | COSMO LEAK TESTER / COSMO INSTRUMENTS CO., LTD.
Master Chamber is a standard reference for Master comparison method leak test that was developed to solve the problem of maintaining actual reference parts. 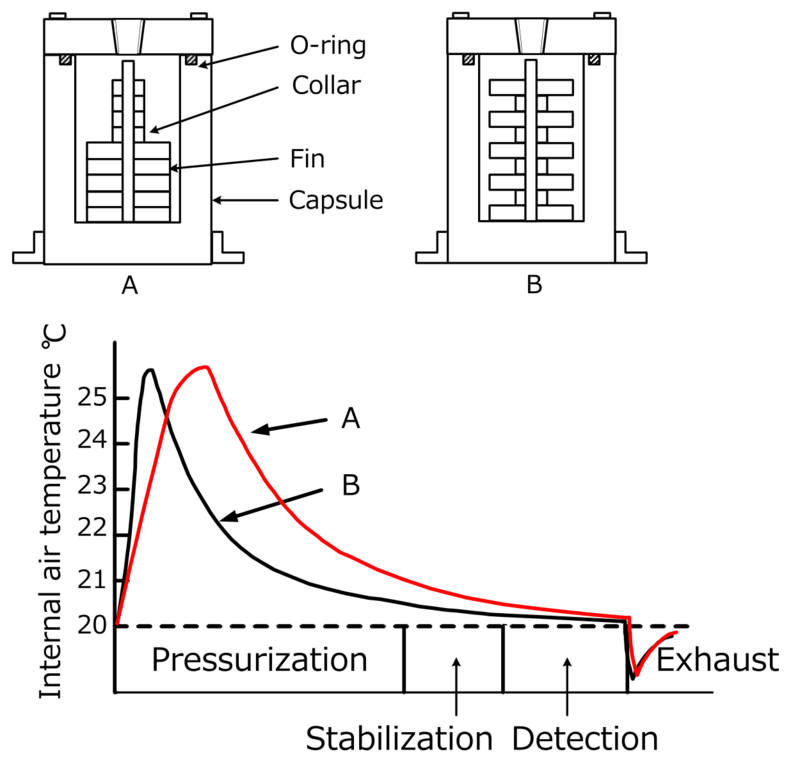 Pressurizing inside tested parts causes rise in air temperature due to adiabatic compression effect. This slight temperature change becomes an error factor for air leak test. By changing the number and arrangement of fins, the Master Chamber changes the volume and surface area, matching the temperature characteristics of the tested part. 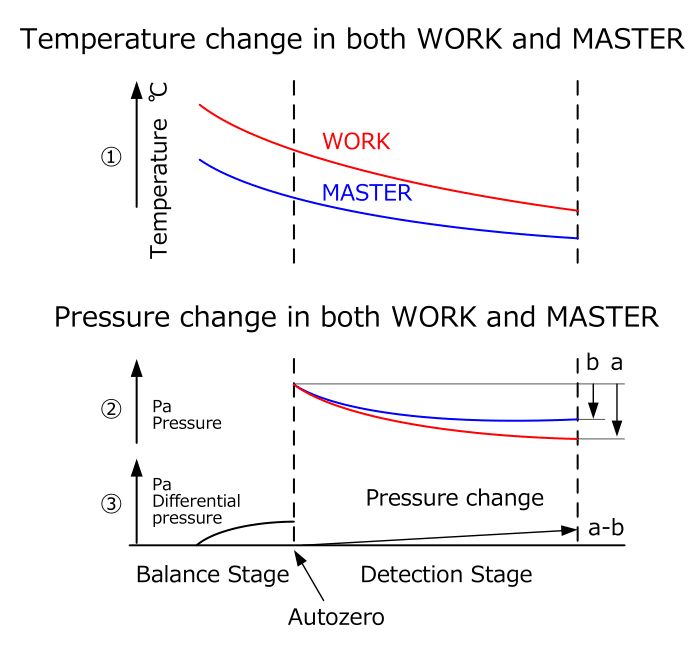 Master Chambers A and B below have different surface area, causing difference in temperature stabilization, which results in change in pressure change characteristic. Mastering which was developed to reduce test time compensates the errors caused by adiabatic compression effect. Use of this feature eliminates the labor hour for adjusting reference (MASTER) to cancel the error. 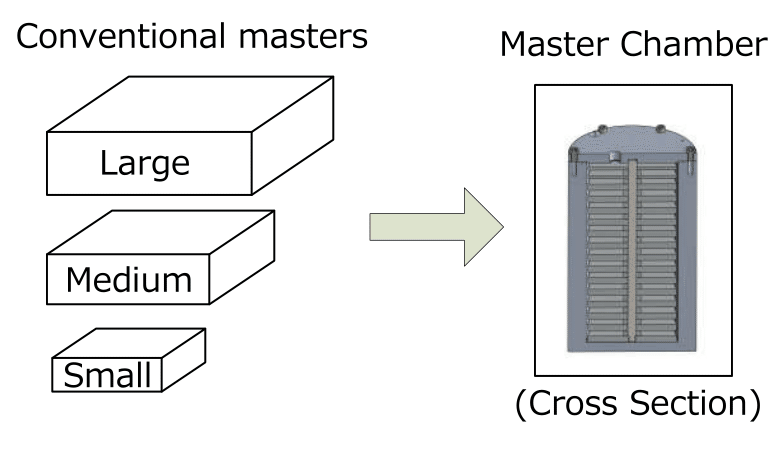 The crucial characteristics of MASTER are temperature stability and repeatability. Repeatability of the reference, MASTER, is very crucial to improve measurement accuracy when Mastering is used. The repeatability of Master Chamber which has specified fins is much higher than the cases where an actual part is used as a reference. In result, test results dispersion will be smaller. ●The labor hours for fine adjustments of internal volumes at installation and maintenance are reduced. ●Performs multiple tests on one reference part. 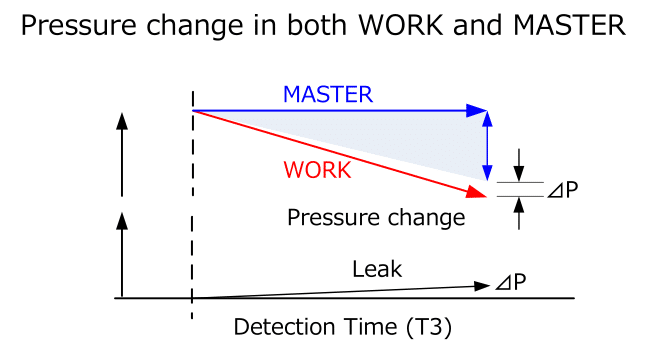 Master change-over is not required.Same Master Chamber can be used for leak testing parts with different volumes. 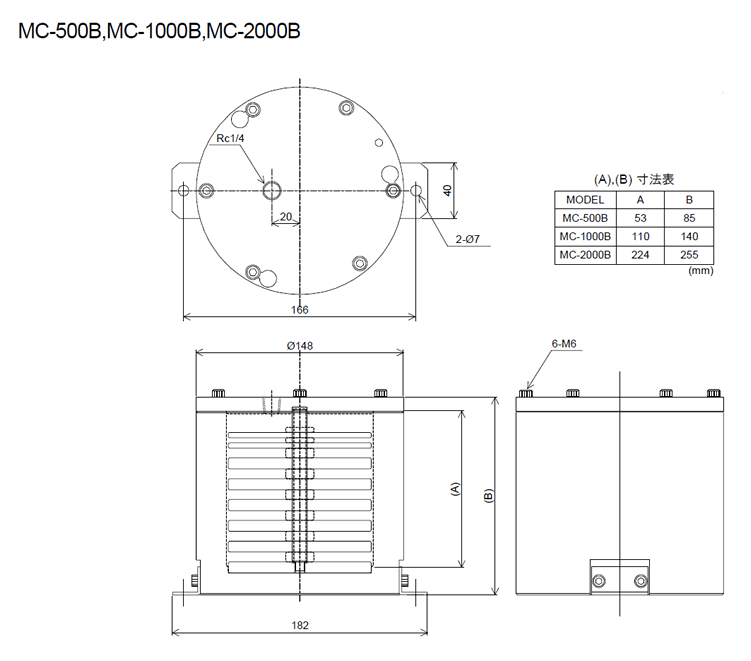 Master Chamber, MC-F02A, which is designed for Mastering can be used regardless of part volume.However, Mastering value may be too large when test time is drastically reduced.In those cased, use MC-500B/1000B to cancel drift at constant amount to make mastering value within the appropriate range. ●Volume of reference (MASATER) should never be zero. Leak test sensitivity gets lowered when MASTER volume is drastically reduced by closing MASTER port vale.This is because the equivalent internal volume of part (WORK) become larger. The higher the test pressure becomes, the bigger the effect is.Master should have appropriate volume although it depends on the required least detecting leak.See [Equivalent Internal Volume calculation] in Cosmo Calculation Sheet . Master Chamber is not necessarily required.Metal or resin pipe with one end plugged can replace it.However, volume of resin pipe may slightly expand by pressurization.The smaller the total pneumatic circuit volume is, the bigger the effect is. Hence the reference (MASTER) for small volume part should be short and thin pipe made of rigid material.Use rigid pipe that is fat enough for sufficient air flow for tested part (WORK) as well. ●When test pressure is high. There are cases that heat gets accumulated in Master by repeating pressurization and exhaustion in short time of period.Using copper pipe which has good temperature stability is effective in those cases.However it has to avoid external temperature effect such as direct wind. ※1) Dedicated to Mastering FeatureThe fins cannot be rearranged. ●MASTER should be installed where it’s free from vibration and heat from motors and wind due to doors opening and closing.Covering MASTER can avoid those factor as well. ●Some time air temperature changes drastically near the floor.Install it where the air temperature is stable. ●When temperature of the test bench changes drastically, place insulation to avoid heat exchange. ※1) Dedicated to Mastering Feature The fins cannot be rearranged.